Books – Kathy J. Marshack, Ph.D.
All of Dr. Marshack’s Books are available at Amazon.com. Have you ever felt victimized, been swindled or lied to by your best friend? Loaned money to loved ones who squandered the gift and never paid you back? Had to fight unscrupulous prosecutors for your freedom? Been forced to defend yourself from a vengeful ex or ungrateful children? Bumped into a beguiling, but shifty, stranger? If so, you’ve crossed paths with someone operating with Empathy Dysfunction (EmD). 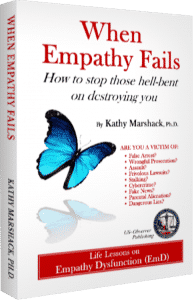 In this book, psychologist, Dr. Kathy Marshack, helps you not only understand why this is happening, but how to protect yourself from those hell-bent on destroying you. 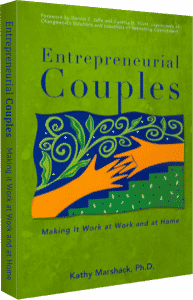 Caught in the squeeze of trying to maintain two careers in today’s tough corporate climate, more and more couples are giving up their jobs in order to start their own businesses. Information on how to have a successful relationship with your autistic spouse! Delve into the dramatic impact autism spectrum disorder can have on the complex world of adult interpersonal relationships. Psychologist Kathy Marshack shares poignant true stories based on her own life and the lives of her clients, focusing on how partners/spouses of someone with ASD can find true meaning and happiness. 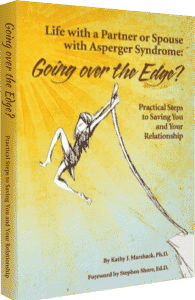 The author discusses sensitive issues and shows readers how to take control of their lives, avoid or grow away from dysfunctional behavior and dysfunctional relationships, and create a successful relationship with their spouse on the spectrum. Author Kathy Marshack, Ph.D., takes an honest look at the unique issues that come up when you’re co-parenting with an “Asperger partner.” It’s a tough assignment because for the “Aspie” (ASD) parent so many of the interactions within the family circle, that require empathy, are literally out of mind – out of sight. This is essential reading for the Neuro-Typical (NT) parent to learn more about “Asperger Syndrome” and find a way to co-parent, co-exist and even thrive within the “Asperger”/NT family unit. 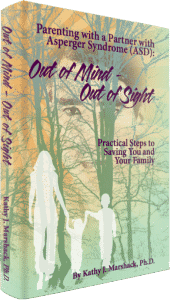 Author Kathy J. Marshack, Ph.D, is a licensed psychologist with more than 33 years of experience as a marriage and family therapist, and a parent of a daughter with AS. Dr. Marshack contributed to this collection of 60 sixty essays with, “Go Directly to Jail.” Find out how humility and an unwelcome event can change everything. Thanks to the generosity of the contributing authors, all of whom provided essays on a pro-bono basis, the royalties generated from the sale of this book will be donated to non-profit organizations dedicated to preventing and curing cancer. Approximately 10,000 baby boomers turn 60 every day. Thats approximately 3.5 million people a year who will be celebrating this event in North America. We have the perfect gift of reading for the 60-somethings in your life. 60 Things To Do When You Turn 60 is a thoughtful, humorous, and sometimes provoking collection of essays written by people from all walks of life on the subject of turning 60.